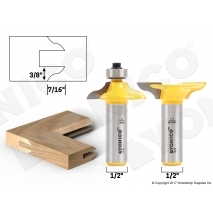 Create extra strong entry and passage doors with the extended tenon entry door router bit set. Aside from the standard rail and stile bits that are included in all entry door sets, this set comes with an additional bit that allows you to create larger tenons and then cope the profile to match the stile. These bits are very large and robust. A sturdy setup is strongly recommended. 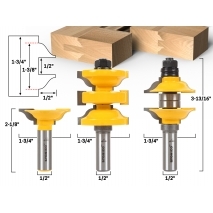 This 3 bit ogee entry door router bits set can cut rails and stiles between 1-3/4" and 1-3/8" thick. The cuting depth is 1/2" and the shank diameter is 1/2". 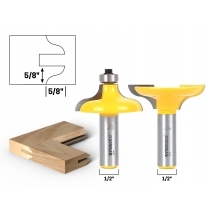 Entry door profile router bits allow you to convert thick tongue and groove doors into rail and stile doors by adding a cope and stick profile to the inside edge of the rails and stiles. These bits are great for custom door shops that create all their doors as tongue and groove and then add the design profile later. The blades are C3 micro-grain carbide tipped. Add a beautiful ogee profile to the inner edge of mortise and tenon entry doors. This set features a cutting height of 5/8", cutting depth of 5/8" and a traditional ogee design with 5/16" radiuses. The blades are C3 micro grain carbide and the shanks are 1/2". 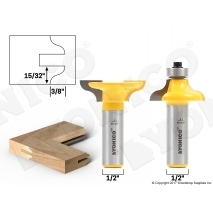 This set features a cutting height of 3/8" and a traditional ogee design with 1/4" radiuses. The blades are C3 micro grain carbide and the shanks are 1/2". Add a beautiful ogee profile to the inner edge of mortise and tenon entry doors. This set features a cutting height of 15/32" and a traditional ogee design with 13/16" radiuses. The blades are C3 micro grain carbide and the shanks are 1/2".